Fun Riders Trike Around the U.S.
FUN Riders Bobby and Dixie Taylor, rode out of Brownsboro, Texas last spring on their 1999 Honda GOLD WING motor trike to experience the trip of a lifetime when they traveled 13,499 miles that covered 32 states around the perimeter of the United States. FUN Riders was established by the Taylors February 26, 2004, as a Charity Organization. FUN means Feeding Underprivileged Neighbors. Before setting out on their journey, Dixie contacted members of the Gold Wing Road Riders Association (GWRRA), explained the purpose of the FUN Riders, and asked if anyone would be willing to meet the Taylors to accept a "food drop" to be passed on to an individual, church or charity organization. The response was phenomenal, and the rest is history. On April 27, 2004 their journey began. In parts on and two of this series the couple has traveled through Texas, New Mexico, Arizona, California, Oregon, and, as we left off last week, Washington State. Even though Washington State is known as the "Evergreen State," the Taylors saw a lot of white. White, as in snow, snow, snow. A "food drop" was made in Port Angeles when the FUN Riders were met by GWRRA members Cindy and Bob Larsen at their hotel the Portside Inn. Next day, the couple headed for Port Townsend where they rode on the second ferry of their trip, (the first being from Port Boliver in Texas over to Galveston Island), that took them to a highway closest to the Canadian border. "We rode ferries all over the country," Dixie said. "If I'd had any idea the tunnels we went through, or the bridges we crossed I would have counted them. One ferry we rode on was three floors tall and had a place to eat with tables and vending machines. I'd never been on a ferry like that. It was almost like a cruise ship." 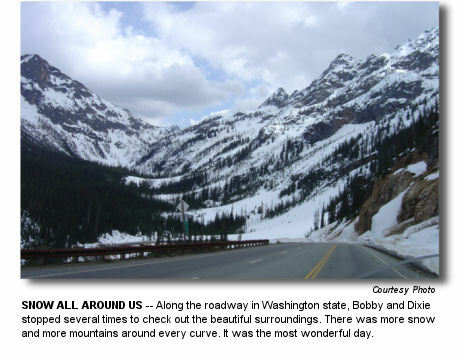 Bobby and Dixie hit Highway 20, going east and encountered some of the most magnificent mountains they had ever seen. "I have never seen such beautiful massive mountains, and many were covered with snow on top,: Dixie said. "We went through a pass that is over 5,000 feet and snow was everywhere. I took 275 pictures that day." They felt a little bit of rain here and there as they continued eastward to the small town of Winthrop, Washington. Dixie describes the town as something from a western movie. "Every building in the town has murals painted on them, and the sidewalks are made of thick boards," she said. 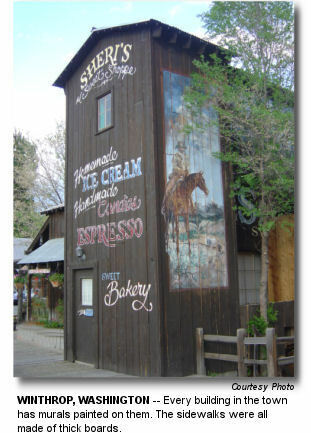 "It really had the appearance of an old western town." Even though the hotel they spent the night in was new, it has the "look" of an old hunting lodge. "It was made of logs and built on a riverbank. Our room had a balcony on the river side and just below was the river that was rushing so fast down the mountain it sounded like we had a waterfall in our room," she said. "That was our favorite spot on the entire trip. There was snow all around us." On the road again the next day, the FUN Riders rode through the northern portion of Idaho making a stop in Sandpoint, Idaho. The "food drop" they made there went to a Food Bank on the Canadian border. A hearty breakfast, and back out on Highway 2 where they would remain throughout the state on Montana. "Everyday there has been something new to do and see and we truly look forward to each day and making new friends," Dixie wrote in an e-mail. "This is a ride of a lifetime." Big Sky Country proved to be just that. Big Sky. Traveling north to Eureka the FUN Riders rode along near the Canadian border where Dixie said they were almost a stone's throw away. "This drive was so beautiful," she said. "We followed a huge lake up the highway for 65 miles before it went on into Canada." Following a trip across Glacier National Park Bobby spotted a small black bear along side the highway eating berries. They decided to turn around and go back for a "photo session." "While I was taking pictures of him, Bobby was looking in all directions for "Momma" bear," Dixie said. "She never did show up. If she had, the motor was set on GO. So needless to say, we would have been out of there!" Dixie said most of Northern Montana is much like West Texas with lots of wide open spaces, long straight miles of concrete and windy, windy, Windy, WINDY!!! They even had to scrape ice off the trike's windshield. The one night spent in Montana was in Wolf Point where they left a bag of groceries with Linda O' Connor owner of the Homestead Motel who said they would go to a Food Bank that had just been recently opened on the Indian Reservation there. Rolling into North Dakota they still had miles and miles of concrete, open spaces and lots of farmland not to mention more wind. "Speaking of farmland, we met a farmer, his wife and son whom we will never forget," Dixie said. "They are GWRRA members Jim and Jill Burtman." By now, it is the middle of May. 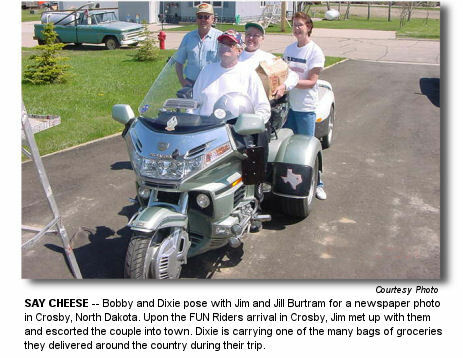 When Dixie called to let the Burtmans know they were on their way, Jim hopped on his Honda, met the FUN Riders and escorted them into town and to their home. While there they were greeted by numerous GWRRA members. Several hours later, with full tummies, the Taylors were on their way, but not before their photograph was taken for the local newspaper. 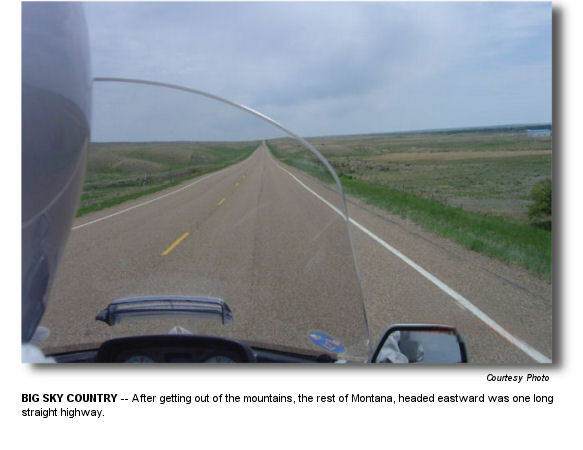 "North Dakota was miles and miles and miles of flat highway," Dixie said. I'll tell you, it was straight as a pencil. It went on and on." Bobby and Dixie said the weather was very cold throughout the northern areas but wearing the people gear protected them well. "The weather was just absolutely beautiful everyday," Dixie said. "The rain was always in front or behind us. Cold and wind was what we faced everyday but the sunshine and clothes we wore kept us very comfortable." The FUN Riders rode in 30 to 40 degree temperatures most mornings but said by noon they were coming out of some of the heavier clothing they wore. "When you are on a motorcycle the wind feels like it is going to life you right off sometimes," Dixie said. The Minnesota "food drop" was taken by GWRRA members Laura and Wally Borah who met the FUN Riders for lunch in Roseau, Minnesota. Dixie fondly refers to Laura and Wally as "kids" because they are so much younger than most of the GWRRA members they have met along the way. "We truly enjoyed their company and they are two more that will be added to our list of new friends," Dixie said. Leaving International Falls, Minnesota for parts east the FUN Riders rode into Duluth, Minnesota and around Lake Superior. May 20th found the FUN Riders in Ashland, Wisconsin, a town on Lake Superior, and 6,585 miles away from home. The temperatures were in the high 70's, a real treat from the cold, windy weather just days before. "Most of the land was pretty flat with some rolling hills and lots and lots of lakes and streams," Dixie said. "I enjoyed seeing all the white trunk Poplar trees and every size "Christmas Tree." Some were fir, some cedar, some spruce, but to me they were all Christmas trees." A "food drop" in Ashland the next day had the FUN Riders meeting GWRRA members Donna and Bill Albertson, owners of Albertson Sugar Bush, a maple syrup business. "When we finally meet all these folks, we feel like we know them already because we have talked to all of them by phone and e-mailed several times before we actually see them," Dixie said. Making good time without even trying, the FUN Riders stopped whenever they wanted and as often as they wanted. "We never get in a hurry and the miles just seem to add up," Dixie said. "The weather has been so good for us and I am sure that is one reason we've made such good time." Dixie and Bobby enjoyed the easygoing pace of the trip thus far, knowing as they get closer to the East Coast and larger cities their time will slow down. "Going through New York City will be an experience!!!" Dixie said in an e-mail from Wisconsin. "I have been through there five times but have always flown in and took cabs to get where I needed to go. That was easy. Now we'll see what it's like on motorcycle"
So far on the trip the FUN Riders say they have seen days where they hardly saw a car. They did see, however, numerous photographers and videographers with their cameras aimed at them throughout their trip. Maybe there were even on the evening news somewhere. Next week, the FUN Riders will continue to meet new friends, encounter inclement weather, and take more spectacular views. Dixie will be able to spend a day without "helmet hair" but after a three-hour trip to Mackinac Island, Michigan she probably wished she had her helmet on to help keep her warm.